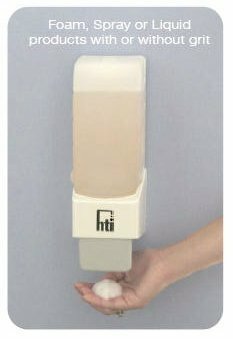 1) Foam pump for foaming liquid soaps. 2) Spray pump for liquid alcohol based disinfectants and sprayable soaps. 3) Standard pump for liquid soaps, gels, lotions of any viscosity and products with or without grit. Approximate dosage per use: Liquid soap: 1 ml or Spray: 1.25 ml. Capacity: 1,000 ml. For use with: Foam soap, liquid soap, lotion, liquid alcohol based disinfectants and grit products. Special features: Foam, spray or regular soap. Disposable pump and refill cartridge system. INSTALLATION NOTE: please observe that the minimum distance between the bottom of the dispenser and a counter-top is 12" (30 cm). Approximate dosage per use: Liquid soap: 1 ml or Spray: 1.25 ml. Alcohol hand sanitizer available in liquid form or gel sanitizer form. 4 gallons per case. 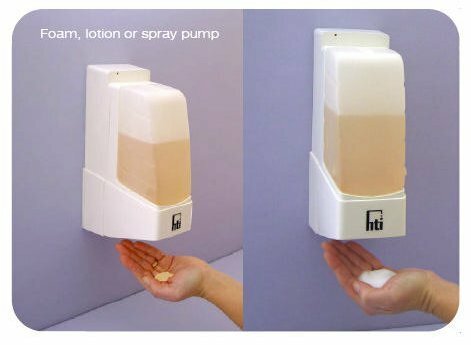 1 gallon will fill the dispenser 4 times.